Perfect autumn recipe. 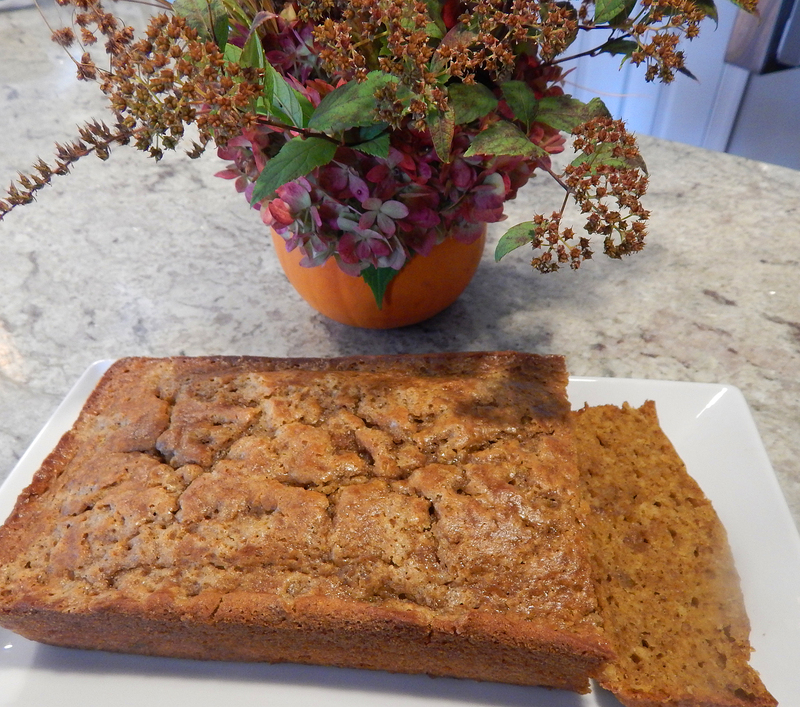 Some surprising ingredients produce a moist, sweet/savory pumpkin bread that really impressed! It calls for chopped walnuts but since we know hubby Russ’s distain for those, I made one loaf with, and one without. Canned pumpkin puree often lends a raw, metallic flavor to pumpkin bread. Cook’s Illustrated cooked down the puree to eliminate those off-putting flavors. Instead of dirtying more dishes, mix the quick bread right in the pot, adding cream cheese and buttermilk for their smooth consistency. A quick-to-assemble topping adds texture and keeps the loaf from getting soggy the next day. FOR THE TOPPING: Using fingers, mix all ingredients together in bowl until well combined and topping resembles wet sand; set aside while preparing bread. FOR THE BREAD: Adjust oven rack to middle position and heat oven to 350 degrees. Grease two 8 1/2 by 4 1/2-inch loaf pans. Whisk flour, baking powder, and baking soda together in bowl. Combine pumpkin puree, salt, cinnamon, nutmeg, and cloves in large saucepan over medium heat. Cook mixture, stirring constantly, until reduced to 1½ cups, 6 to 8 minutes. Remove pot from heat; stir in granulated sugar, brown sugar, oil, and cream cheese until combined. Let mixture stand for 5 minutes. Whisk until no visible pieces of cream cheese remain and mixture is homogeneous. Whisk together eggs and buttermilk. Add egg mixture to pumpkin mixture and whisk to combine. Fold flour mixture into pumpkin mixture until combined (some small lumps of flour are OK). Fold walnuts and ginger into batter. Scrape batter into prepared pans. Sprinkle topping evenly over top of each loaf. Bake until skewer inserted in center of loaf comes out clean, 45 to 50 minutes. Let breads cool in pans on wire rack for 20 minutes. Remove breads from pans and let cool for at least 1½ hours. Serve warm or at room temperature. The test kitchen’s preferred loaf pan measures 8 1/2 by 4 1/2 inches; if using a 9 by 5-inch loaf pan, start checking for doneness five minutes early. Although we used the larger loaf pans and it took every bit of 55 minutes to fully bake. Published September 1, 2012 from Cook’s Illustrated.